A young French photographer, working under the name JR (because his public-space exhibitions have often been illegal), won the TED 2011 Prize. His project consists of posting huge billboard-sized portraits of people in public spaces. By doing so, he has sought to break down stereotypes and enmities. 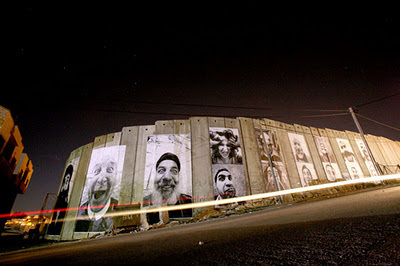 Most effectively, he posted dyptich portraits of Israelis and Palestinians from the same occupations, on either side of the Israel-Palestine wall. People had to look closely to see the captions, which stated which portrait was of a Palestinian and which was of an Israeli. Once he had left the location, the portraits continued to stimulate a lot of discussion. There are images and an audio interview on the Lens Culture website. Check out JR's website, too.